You are currently browsing the category archive for the ‘Press’ category. That was way too long and way too strange a title. What I meant to say was… I now have a twitter! Just letting you all know, that’s all. Oh and the mania starts on Sunday, flight is booked, accommodation is sorted, Melbourne here I come! If all goes well, there might just be a little not-so-live blogging while I’m there. Until then, I’m off to stress and panic about what to wear and what to pack, gahhhh!!! 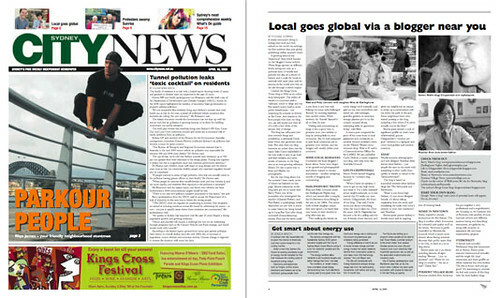 Ain’t nothing like a little self promotion :) City news is a local newspaper for the Sydney city central area and recently I was featured in an article about local bloggers, you can even see a little mugshot of me. City news doesn’t have a huge amount of circulation, but still, it’s nice to see my name printed on paper, knowing someone might read the article and check out this blog. Woolloomooloo photographer and web designer Xiaohan Shen shoots street fashion – just people she sees on the street with something to their outfit, from quirky to trendy to casual to the “fashion-forward”. 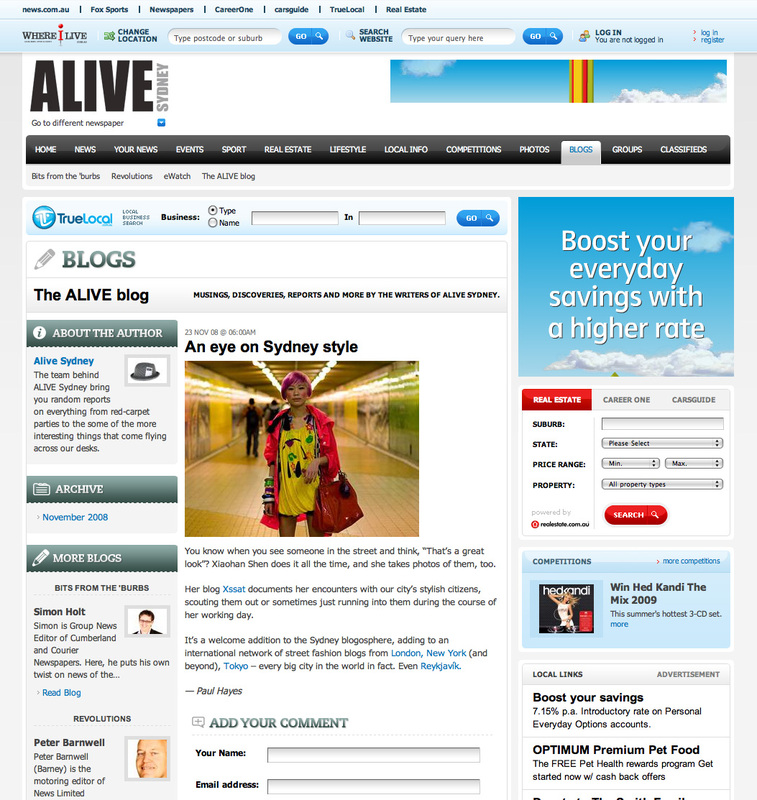 The blog is based on successful overseas street fashion blogs like The Sartorialist and Facehunter. “Xssat is not about high fashion, it’s not about designer brands, it’s about taking inspiration from the street and translating the looks with what’s already in your own wardrobe,” said Xiaohan. Recent posts picture Sydney’s bowtie trend and its ongoing love of wearing black. If you are interested you can download the whole issue and read the entire article here. I got an email a few days ago from Alive Sydney asking whether they have permission to link to my blog, of course I said yes, any publicity is good publicity! But I didn’t know it was going to be a cool little write up, I’m pretty stoked, this is the first press coverage xssat has received. Click on the image to see bigger or here to read the article. End of self promotion… for now.